Francine had devised a cunning plan to barter for the use of Mike & Linda’s washing machine: maniac that she is, she volunteered to help Linda working on her allotment (a.k.a. the farm) for half a day. The allotments in these parts are v. large and appear to constitute a full-time job for one person. Since Linda is currently working on an assignment en Angleterre with only occasional weekend returns to France, she was more than happy to accept the bartering arrangement. Mike and I share both an interest in wildlife and a dislike of gardening so we left the ladies to it while we went in search of my unidentified butterfly. The brief glimpses I’d had on a couple of days made me suspect its identity but I needed a better look and, if possible, a photographic record to be certain. We set of à bicyclette into the marsh. My suspects seem to like basking on the woodland tracks but they can be difficult to see. The first sign that one is present is usually its being scared up as one’s bike approaches. Off it flutters. At our first encounter, I got a few very poor distance shots but nothing capable of helping. We found a second sunny spot deeper in the marsh where I began trying again. I’m sure they sense vibrations from footfalls on the track and sneaking up close enough was proving très difficile. My stalking attempts were not helped as first one, then another, and finally a third car drove along our otherwise deserted woodland track scaring off my quarry even when I was getting it right. What is this, Piccadilly Circus? After much effort and not a little frustration, I finally got a shot of a very attractively marked but relatively dull brown-coloured butterfly basking on the ground. One footfall too many and, of course, off it fluttered. 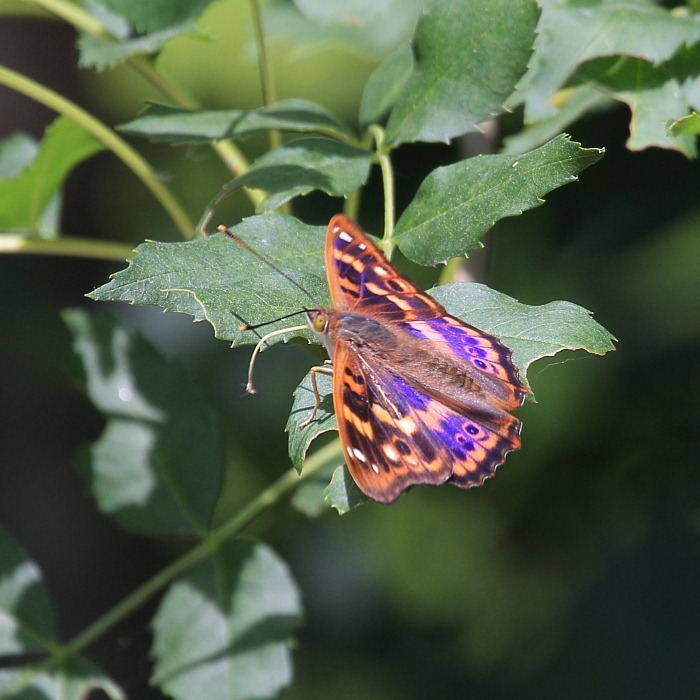 It fluttered into a sunlit bush beside the track. Lepidoptera, the scientific term for butterflies and moths, means “scaly winged” and some scales can be capable of performing neat tricks in the correct lighting conditions. In this case, when seen from the side or front, a rather dull brown colouration was transformed by a very imperial purple sheen. 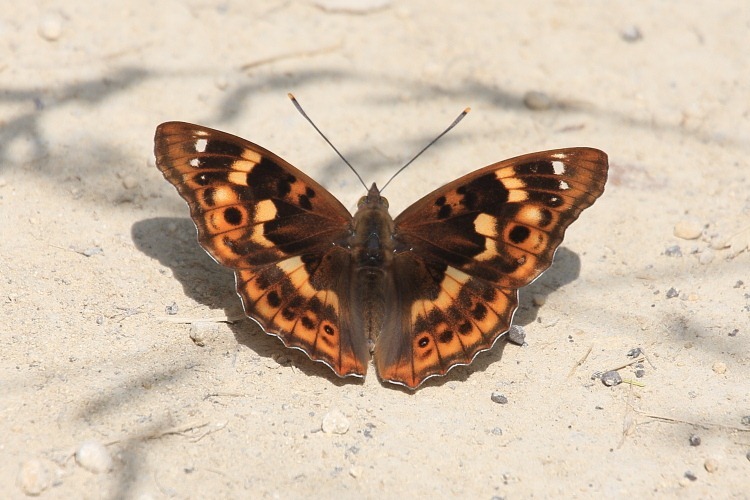 The Purple Emperor (Apatura iris) had donned it’s finest clothes and confirmed its identity. What a transformation. 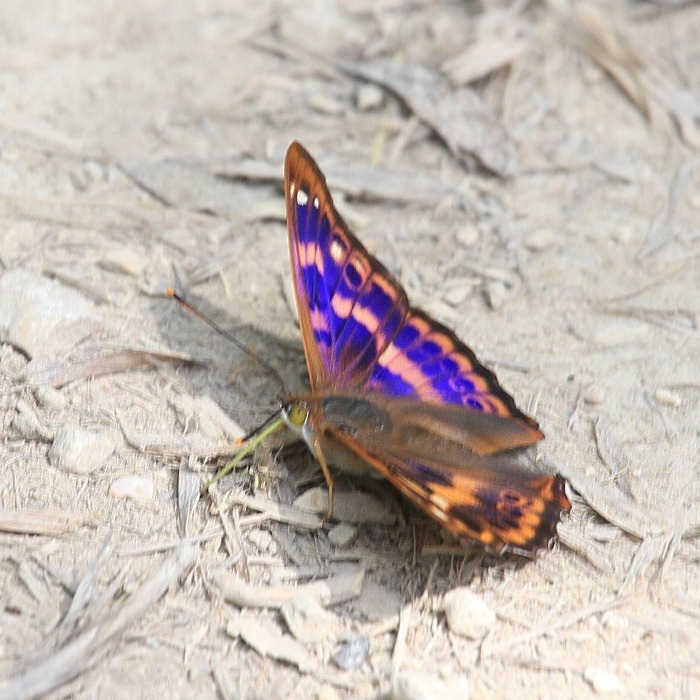 The side shot on the track shows how critical the angle of view can be with one wing showing purple and the other not. I’d only ever seen one specimen before and that was dead as a result, I suspect, of a “road traffic accident”. They are so much more impressive alive and vibrant.